Happy Monday lovely pinners, and I do hope our UK bloggers are surviving the current storm. Truly scary weather here this weekend! This week’s party is being brought to you by the blogging beauty Cat from Yellow Days. Do pop by to see who she has chosen to feature from last weeks fantastic pins. 1. Link up one, or more, of your own parenting/family posts. You can link to the post directly, or to a pin of the post of you prefer. 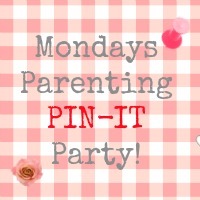 Each entry will be pinned to the Monday Parenting Pin-It Party board on Pinterest for everyone to find. 3. Check out some of the other awesome entries and you are bound to find some great stuff to pin and some pinners you may wish to follow. Do let them know you have pooped by as they may wish to follow you too. Hi Jen! Thank you for hosting this Pin-it party. This is my first ever, it sounds so fun I couldn’t resist. I’m sorry the UK is experiencing bad weather, hurricanes are awful. I may have to change my name after Hurricane Sandy wiped out New York and Jersey. Thanks for joining in Sandy 🙂 I hope you find some great stuff to pin! Oh thank you! That is lovely to hear. Hope you find some great stuff to pin 🙂 Thanks for joining in.